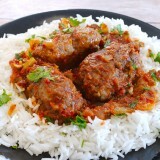 An original recipe for lovely meatballs stuffed with red pepper pesto, doused in a garlicky tomato sauce and ready to be indulged with spaghetti al dente! Tomatoes, onions, garlic, olive oil and peppers…the ultimate ingredients in which Mediterranean cuisine is based on. Someone told me at some point that 90% of Greek meals start by frying onions in olive oil. Maybe that’s an exaggeration. But there is definitely some truth in it. I didn’t eat pork for some time and I was really craving some. Instead of making some nice and juicy shoulder pork steaks I thought it would be more interesting to combine it with the other two food-related things I love on this planet: tomato sauce and pasta. Did I tell you that I make a mean tomato sauce? The red pepper pesto gives another kick to the meatballs. 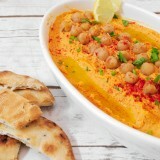 It’s garlicky, easy to make and adds delicious flavours to the end result. It’s similar to the famous basil pesto but with peppers. Yummy! Make sure you check out my other recipe for penne with the pepper pesto sauce. OK, back to the meatballs. 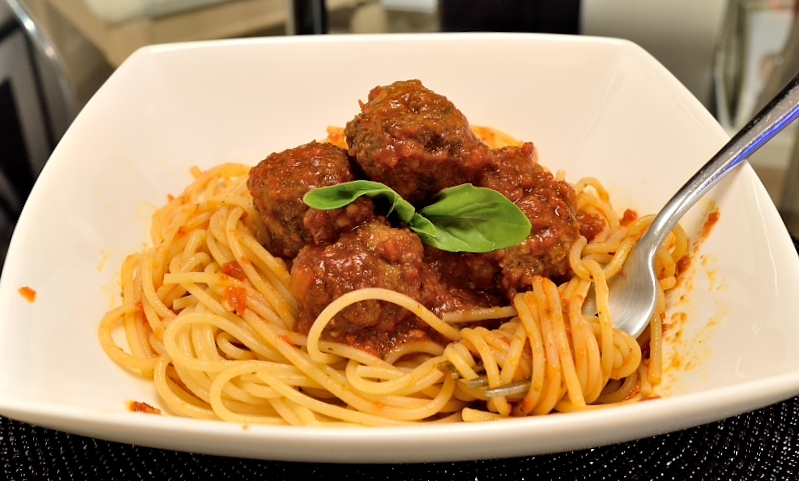 I like to combine the pork with veal when it comes to fried meatballs or burgers. You can try it with some nice quality beef too. The choice is yours All I can say is that they are delicious! The key is the fresh thyme, it really takes them to another level. They will be consumed in no time. So, maybe you need to make some more! 250 gr (9 oz) ground pork. 250 gr (9 oz) ground veal or beef. Small bunch of fresh thyme. 3-4 ripe and sweet tomatoes. A small bunch of flat-leaf parsley. 500 ml (2 cups) tomato passata. 1 cup extra-virgin olive oil. Preheat the oven at 190 degrees Celsius (375 F). Place a piece of greaseproof paper on a tray and add the red peppers. Cook them until they start getting brown, about 20 minutes or more. Let the peppers cool down and remove the skin. Add them into the blender together with 4 garlic cloves (less if you are not a big fan of garlic), the pine nuts and 2 tablespoons of olive oil. Create a smooth paste and set aside. Into a large bowl, add the meat together with the red pepper pesto, 1 finely-chopped onion, fresh thyme, 1 tablespoon of oregano, cumin and 1 teaspoon of paprika. Season with salt and pepper to your liking and knead for a few minutes to mix all the ingredients well. Cover with cling film and put it in the fridge for ~ 1 hour. 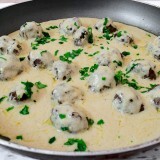 Use the meat mixture and make small and round balls. Heat ½ cup of olive oil (maybe more) in a large frying pan on medium heat. Fry the meatballs until they start getting brown, not too much. They will continue the cooking in the sauce later. Place them on a plate covered with kitchen towel to absorb the excess oil and set aside. Add the fresh tomatoes, 2-3 garlic cloves and the parsley in the blender and make a nice paste. Heat 4-5 tablespoons of olive oil in a large frying pan on medium heat. Add the onion and fry it until it softens. Add the fresh tomato paste, 1 tablespoon of oregano, 1 teaspoon of paprika and the tomato passata. Season with salt and pepper to taste. Give it a stir and let it cook on low heat for ~ 15 minutes. Stir it from time to time. 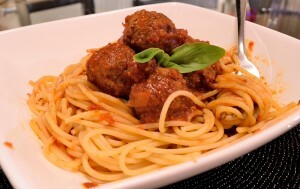 To save time, you may make the sauce while the meat mixture is in the fridge. 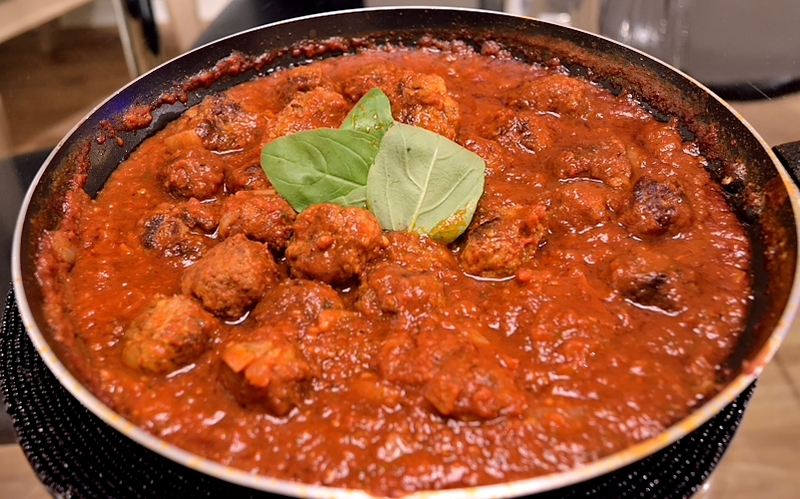 Add the meatballs into the pan with the sauce, lower the heat to minimum and let them cook altogether for 30-45 minutes. Serve it with spaghetti “al dente” with lots of grated parmesan.